Drivers who are mistakenly assigned parking tickets can use this police complaint letter to request a review of the citation. 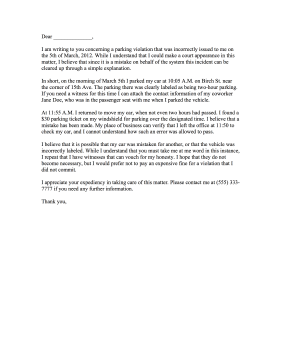 I am writing to you concerning a parking violation that was incorrectly issued to me on the 5th of March, 2012. While I understand that I could make a court appearance in this matter, I believe that since it is a mistake on behalf of the system this incident can be cleared up through a simple explanation. In short, on the morning of March 5th I parked my car at 10:05 A.M. on Birch St. near the corner of 15th Ave. The parking there was clearly labeled as being two-hour parking. If you need a witness for this time I can attach the contact information of my coworker Jane Doe, who was in the passenger seat with me when I parked the vehicle. At 11:55 A.M. I returned to move my car, when not even two hours had passed. I found a $30 parking ticket on my windshield for parking over the designated time. I believe that a mistake has been made. My place of business can verify that I left the office at 11:50 to check my car, and I cannot understand how such an error was allowed to pass. I believe that it is possible that my car was mistaken for another, or that the vehicle was incorrectly labeled. While I understand that you must take me at me word in this instance, I repeat that I have witnesses that can vouch for my honesty. I hope that they do not become necessary, but I would prefer not to pay an expensive fine for a violation that I did not commit. I appreciate your expediency in taking care of this matter. Please contact me at (555) 333-7777 if you need any further information.